In the wilderness of Surrey, I went on a tiger hunt. A hunt for tiger beetles, that is. 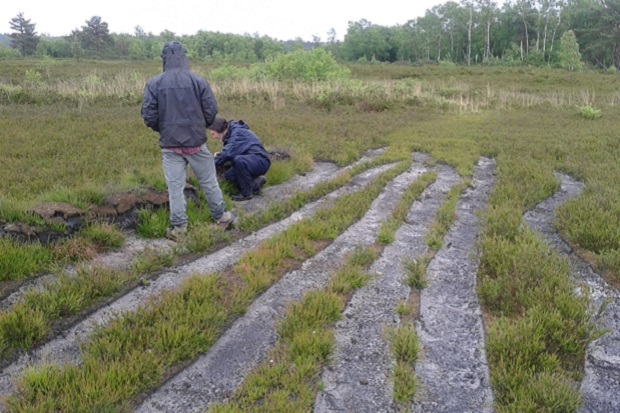 I work for Natural England as a warden on the Thames Basin Heaths Special Protection Area, an amazing 8,200 hectares of very special lowland heath habitat across Surrey, Hampshire and Berkshire. The heath tiger beetle, Cicindela sylvatica, should be widespread on my patch, but is sadly in massive decline. To help the beetle thrive once more, the Species Recovery Trust, with funding from the People’s Postcode Lottery, has launched a project. 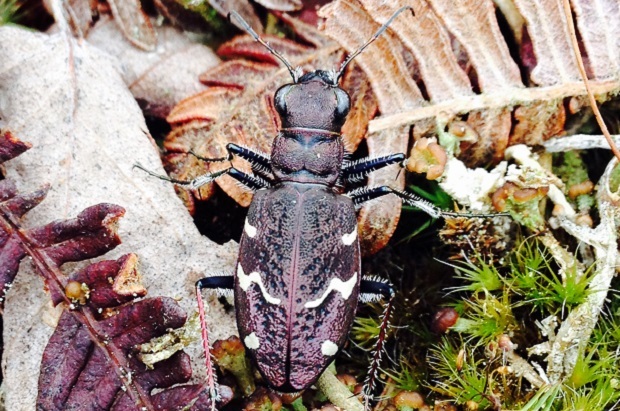 Over the coming months they’ll be training volunteers to look for the heath tiger beetle, researching its ecology and developing a conservation plan with land managers. As a warden, I get to walk around the Thames Basin Heaths talking to visitors - the perfect opportunity to become a roving tiger stalker. So last month I volunteered to attend a free training course run at nearby Thursley National Nature Reserve, managed by Natural England and still a stronghold for the beetle. Here Scotty Dodd of Surrey Wildlife Trust and James Giles, Natural England’s Reserve Manager, coached us in tiger stalking! Unfortunately the day of the course turned out to be a rather soggy one, not ideal for stalking sun-loving invertebrates. The best conditions are dry, sunny days, with no more than a light breeze, April to September. But we were still able to get into the field. We donned wellies and waterproofs and went out to see the amazing work being done at Thursley to create tempting habitat for this rather particular creature. It may sound odd, but bare ground is essential. A female will only lay her eggs on sandy areas where the larva will be able to dig a vertical burrow to live and hunt from. Scotty explained how the larva lurks in the burrow, waiting for its unsuspecting prey to pass by. Scotty Dodd examining the bank of turves, ideal for other invertebrates such as ants. In days gone by people lived off the land, using the resources of the heaths. Firewood was collected, animals were grazed and heather turves were cut for fuel. Over the centuries this kept the heaths open, with a patchwork of plentiful bare patches and very few trees. This suited the heath tiger beetles down to the ground, but those days are gone and no one lives off the land anymore. Now land managers need to remove encroaching trees and create the bare ground artificially. Each winter, James and his army of volunteers cut back the scrub, and he showed us where heather turves have been stripped, providing the ideal habitat for female beetles to lay their eggs. Looking for the larval burrows is one way to survey for the beetle, but even better is to stalk the adults. Essential skills are a keen eye, a light step and careful shadow placement! So hopefully, for me and the tigers, this rather damp summer will improve and I shall be out scouring the heaths’ bare patches. Will I be the lucky one to report a sighting on the Thames Basin Heaths? I don’t know, but let’s hope that the project is a great success and this charismatic species is seen thriving on the heaths once more. Sarah Bunce is a warden for the Thames Basin Heaths Partnership, a project hosted by Natural England that involves working with visitors & communities to conserve the protected area & its wildlife. Read more on heath tiger beetles and how they're managed.